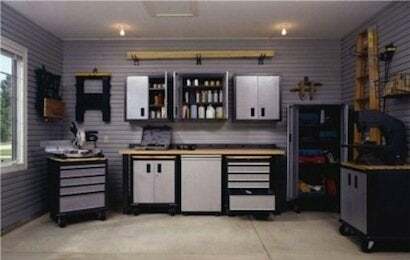 Installing a garage storage system can have the same effect as adding a room, and it’s a good way to increase your home’s value. Start by grouping the bins and bulky items you need to store by their use, and measuring them so you know how much space you need for each group. Tall cabinets with double doors are great, but be sure they come with enough adjustable shelves to optimize the space inside. Include at least one lockable cabinet for dangerous chemicals. If you’ve got a lot of ceiling height in your garage, use it. Try an overhead storage rack for seasonal items or a bike lift. For easier cleaning, keep things off the floor: store sports gear and yard tools on heavy-duty, wall-mounted hooks and racks. Look for systems made of metal, plastic or wood specifically treated for garage use. Add some low cabinets on casters with a work surface on top. Put up some pegboard or a vinyl slat wall system for tools, and you’ve got the beginnings of a home workshop.